Human activities are threatening the health of the world’s oceans. More than 80 percent of marine pollution comes from land-based activities. From coral bleaching to sea level rise, entire marine ecosystems are rapidly changing. Global warming is causing alterations in ocean chemistry and many oceanic processes, and it is threatening many species of marine animals that cannot cope with higher temperatures. Overfishing is a serious problem in many parts of the world. Conservationists advocate creating expansive marine reserves to protect the biodiversity of the oceans. Global warming is causing sea levels to rise, threatening coastal population centers. Agricultural ocean degradation is the result of pesticides and nutrients used in industrial agriculture that ends up in the coastal waters, resulting in oxygen depletion that kills marine plants and shellfish. The United Nations Food and Agriculture Organization estimates that 31.4 percent of fish stocks are either fished to capacity or overfished. 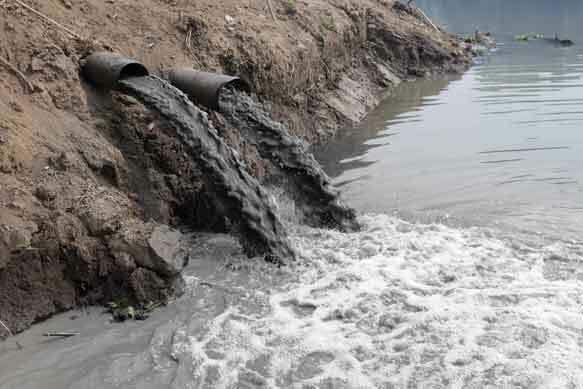 Ocean dumping from factories and industrial plants discharge sewage and other runoff into the oceans. Oil spills pollute the oceans, though U.S. water-sewage treatment plants discharge twice as much oil each year as tanker spills. Air pollution is responsible for almost one-third of the toxic contaminants and nutrients that enter coastal areas and oceans. Radioactivity from nuclear testing in the 1950’s and from nuclear accidents like Fukushima Daiichi as well as from The Dome, Novaya Zemlya, and many other nuclear incidents impacts the world oceans. Plastic pollution, the miracle material has made modern life possible is choking our waterways. Chemical and heavy metal pollution are forms of well-known ocean contaminates that afflict aquatic life. Red tides caused by massive growth of algae can become harmful to both the environment and humans, which is why scientists often refer to them as harmful algal blooms or HABs. Invasive species such as poisonous algae, cholera, and countless plants and animals have entered harbor waters and disrupted the ecological balance. Marine heat waves and spikes in sea temperatures stress marine ecosystems, particularly coral reefs and are getting worse. Ocean acidification is the ongoing decrease in the pH of the Earth’s oceans, caused by the uptake of carbon dioxide (CO2) from the atmosphere. Seawater is slightly basic (meaning pH > 7), and ocean acidification involves a shift towards pH-neutral conditions rather than a transition to acidic conditions (pH < 7). Establish marine parks to protect biodiversity. Reduce destructive fishing practices such as trawling. Minimize the use of military sonar that can harm or kill whales and other marine mammals. Help fishers to maintain their livelihoods by incorporating conservation efforts. Install measures to reduce the amount of fish caught accidentally.